– Ctrl+Alt+Up/Down key makes column selection for multiple input points. – Alt+Mouse click makes multiple input points. – Consecutive ‘Select Word’ command adds next occurrence to the selection. – Allows column selection in word wrap mode. 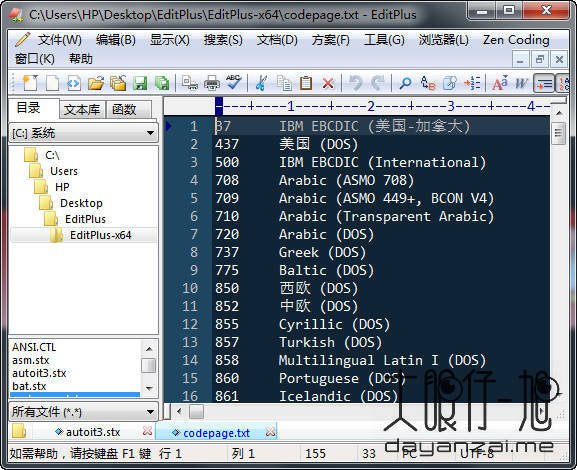 – Improves right-to-left language support. – Improves speed of brace highlighting. – Allows multiple hotspots in cliptext. – Find in Files preserves ‘case sensitive’ and ‘whole word only’ options between sessions. – ‘Delete Blank Lines’ command includes lines with tabs and spaces only. – Updates HTML toolbar for HTML 5 elements. – Function list supports ‘Retain Filter Text’ menu option. – Ctrl+Shift+F shortcut key for Find in Files. – Record Keystrokes command now supports recording file open command. – When uploading a file to ftp server fails, it now displays a message box for retry. – Pasting text over multiple input points now retains current multiple input points. – Ctrl+Alt+Left/Right key for extending column selection. – ‘Tile Horizontally/Vertically’ button on the Window List now automatically closes the dialog box. – Fixes an issue where keyboard-interactive sftp authentication didn’t work correctly. – Fixes an issue where remote files could be saved to wrong directory. – Fixes an issue where ‘Duplicate Sel’ could cause memory leak. – Fixes an issue where ‘Editor Font 6’ option didn’t work correctly in Korean Windows. – Fixes an issue where Home key on wrapped line could place cursor in the previous line. – Fixes an issue where toolbar could be moved to wrong position if the program window is minimized. – Fixes an issue where syntax highlighting could be incorrect when editing stx/acp files.